This chapter presents the major areas of spacelift. The discussion includes an overview of major launch vehicles and a short look at the launch process. US launch bases consist of two major facilities operated by Air Force Space Command. Cape Canaveral Air Force Station (AFS), Florida, and Vandenberg Air Force Base (VAFB), California. The Department of Defense established the 45th Space Wing at Cape Canaveral Air Force Station and the 30th Space Wing at Vandenberg Air Force Base, also known as the Eastern and Western Ranges respectively. These national assets provide the space, facilities, equipment, and systems required to develop and test aeronautical, space launch, missile, and other technical and scientific programs and activities. Both ranges share similar responsibilities. With their vast arrays of radar, telemetry receivers, optical trackers, and command transmitters, the ranges track missile flight and destroy those that deviate off course. The consequences of failing in this task are so potentially disastrous that this job takes on great significance. In addition to performing important missile safety functions, the ranges provide valuable telemetry relay and analysis for space, ballistic, and aeronautical operations. Telemetry information allows quick failure analysis and aids in the development of future aerospace systems. The Eastern Range consists of a series of stations, including Cape Canaveral Air Force Station, and the Jonathan Dickinson Tracking Annexes on the Florida mainland. Also part of the Eastern Range are Antigua Air Station (AS) in the West Indies and the British-owned Ascension Auxiliary Air Field in the south Atlantic Ocean. Range instrumentation ships, such as the USNS Redstone and a fleet of advanced range instrumentation aircraft from the 4950th Wing at Wright-Patterson Air Force Base, Ohio, can augment these stations. In addition, the Eastern Range may use other DOD and/or National Aeronautics and Space Administration (NASA) facilities to meet the requirements of any mission or operation. The Western Range provides multifaceted research and development test capability and management of a network of test facilities throughout California, Hawaii, and the south Pacific Ocean area. The range uses radar, optic, telemetry, and communication instrumentation to acquire critical data that serves as the basis for improvements in US ballistic, space, and aeronautical systems. In the process of facilitating access to space and space operations as directed by the chief of staff of the Air Force, AFSPACECOM assumed command and control of the Air Force launch bases, ranges, and associated facilities. As current and planned launch systems complete development, they will transition to AFSPACECOM operational elements, which will assume responsibility for providing all required launch services. Vandenberg AFB can trace its heritage to the beginning of World War II when it was a major US Army training base. Construction of the 90,000-acre Army installation started in September 1941. The Army designated the installation Camp Cooke in honor of Maj Gen Philip St. George Cooke, a cavalry officer during the Mexican-American war. From its activation on 5 October 1941 to the end of World War II, armored and infantry divisions trained at the camp. In 1944 the Army established a prisoner of war camp there, which eventually accommodated over 8,700 German and Italian prisoners. Additionally, a maximum security Army Disciplinary Barracks (now the US Penitentiary, Lompoc) was constructed on the camp. The Army deactivated Camp Cooke in June 1946, only to reactivate it from 1950 through 1953, after the outbreak of the Korean conflict. While engaged in intercontinental ballistic missile (ICBM) studies coupled with advancements in rocket design and thermonuclear research, the Air Force transformed Camp Cooke to an ICBM training base and on 7 June 1957 renamed it Cooke Air Force Base. The Air Force revamped the old Army training camp to a modern missile launch and control complex and renamed it Vandenberg AFB in October 1958 to honor Gen Hoyt S. Vandenberg, second Air Force chief of staff and an aerospace advocate. Two months later, the launch of a Thor intermediate range ballistic missile marked the first major operation from the Western Test Range. Over the years, launch, ballistic, and aeronautical activity at Vandenberg has steadily increased, and VAFB continues to be the primary launch location for polar-orbiting satellites and operational ICBMs. The base is ideally suited for polar and retrograde launches with inclinations from 70 to 104 degrees. Currently, there are five active space launch complexes at Vandenberg AFB (table 2). Space Launch Complex 6, built for the space shuttle, is in mothball status. Source: Maj Dale Madison, USAF, interview with the editor, December 1991. Cape Canaveral Air Force Station (CCAFS) is adjacent to NASA's Kennedy Space Center. 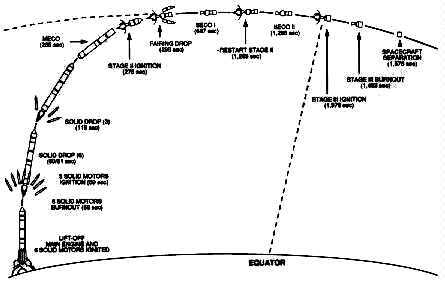 Range safety limitations restrict launches from the cape to orbital inclinations from 28.5 to 57 degrees to prevent overflights of Newfoundland and the Bahamas.9 Currently, there are eight active space launch pads at CCAFS and the Kennedy Space Center (table 3). There are three categories of today's launch vehicles. The first category contains the small launch vehicles, the solid controlled orbital utility test (SCOUT) and the Pegasus which are capable of carrying from 500 to 1,000 pounds into low-earth orbit. The medium class of the Delta II, the Titan II, and the Atlas I and II is next. The Delta II can boost approximately 4,010 pounds to geostationary transfer orbit (GTO). The Titan II can boost about 4,200 pounds to a 100-nautical-mile polar orbit, and the Atlas II can carry about 5,800 pounds to GTO. Vought Astronautics (now Ling-Temco-Vought) developed the SCOUT from a requirement of the National Advisory Committee on Aeronautics (NACA) (the forerunner of NASA) for a small space launch vehicle. Paralleling this effort was the Air Force's interest in advanced solid rocket motors. Thus, the Air Force and NACA agreed to a joint development program--the SCOUT--to be based at Langley Field, Virginia, in 1958. Vought Astronautics was given a contract in 1959 to design and develop structural elements of the SCOUT vehicle and launch tower. In 1960, NASA increased Vought's responsibilities as sole integrator. This role included responsibilities from design and fabrication to payload integration and launch. The SCOUT has had a flight success rate of 95.5 percent since its first launch in December 1963. The SCOUT was the first US launch vehicle to use solid fuel exclusively in all stages. The standard SCOUT is a four-stage vehicle approximately 75 feet in length, with an optional fifth stage available for launching smaller payloads into higher elliptical orbits. The SCOUT employs a dual-purpose launcher/transporter combination that permits checkout of the vehicle in the horizontal position and launching in the vertical position. The launcher has a movable base which permits azimuth control up to 140 degrees. A cantilevered elevating launch boom provides pitch control to the 90-degree vertical position. There are two active launch sites for the SCOUT--NASA's Wallops Flight Facility on Wallops Island, Virginia, used for eastern launches, and Space Launch Complex 5 at Vandenberg AFB, California, used for high inclination missions. The Wallops Flight Facility, developed after World War II to launch sounding rockets, is located on an island in northeast Virginia. In the past three decades, the Wallops complex has launched more than 14,000 rockets and missiles. Its first orbital launch took place in 1960 using the SCOUT. Since then 20 SCOUTs have orbited from this site.15 There are two SCOUT boosters remaining. One is reserved for a space test program payload and the other for a SDIO experiment. Both are expected to be launched in 1993. The second of the small launch vehicles is the Pegasus, which is a three-stage, solid-propellant, all-composite, winged rocket. The Pegasus provides a cost-effective, reliable, and flexible means of placing small payloads into suborbital or orbital trajectories. This air-launched space booster is the product of the privately funded, joint venture of Orbital Sciences Corporation and the Hercules Aerospace Company. Several factors contribute to the performance of the Pegasus. First, there is the potential and kinetic energy contributed by the carrier aircraft. Next is reduced drag due to lower air density at the higher altitudes at which it is launched. Also, higher nozzle expansion ratios provide for improved propulsion efficiency in addition to the reduced gravity losses due to its unique flat trajectory and wing-generated lift. Pegasus can deliver payloads up to 900 pounds to low-Earth orbits or payloads up to 1,500 pounds on suborbital, high-Mach-number cruise, or ballistic flights. Payloads as large as 72 inches long and 46 inches in diameter can fit within the standard payload fairing.20 Through a choice of launch points and azimuths, Pegasus can achieve a complete range of circular and elliptical orbits, with a wide variety of prograde and retrograde inclinations. Advantages over conventional pad-launched boosters include an increased range of orbital inclinations achievable without energy wasting maneuvering during the launch phase and extended launch windows resulting from the flexibility of launch point selection. Additionally, ascent profiles generate lower acceleration, dynamics pressure, and structural and thermal stress providing the payload a gentler ride into orbit. One of the most significant advantages of the Pegasus system is the elimination of the ground launch pad and the need for lengthy launch pad refurbishment. The carrier aircraft requires only routine aircraft maintenance after each flight and standard periodic maintenance. Also, as already noted, air launch allows flexibility in selecting the launch point. This flexibility can be used to optimize the mission trajectory, improve range support coverage, provide a greater range of available launch azimuths, heighten operational security, and minimize environmental impacts via remote over-water launching. Furthermore, this flexibility provides the ability to choose a launch point anywhere in the world, which allows first pass orbit coverage over any point on the Earth's surface. Pegasus also offers flexibility in other areas. The launch location can be chosen to, in some cases, double the standard 10-20 minute Sun-synchronous launch window. Air launching provides greater launch availability since the carrier aircraft can launch the vehicle above most weather systems. Unlike vehicles requiring fixed launch sites, the Pegasus can deliver payloads to any desired inclination, from equatorial to beyond Sun-synchronous from a single base of operations. Since the vehicle and payload are integrated in a processing facility and not on the launchpad, separate missions can be readied for launch simultaneously. The first medium-class launch vehicle to be discussed is the Delta. The Delta space launch vehicle has been the workhorse of the US booster inventory. Since 1960, it has been launched over 200 times with an impressive success rate of 98.4 percent.21 The family of Delta launch vehicles originated in 1959 when NASA's Goddard Space Flight Center awarded a contract to Douglas Aircraft Corporation (now McDonnell Douglas Corporation) to produce and integrate 12 launch vehicles capable of carrying medium-class payloads. The baseline Delta (launched in 1960) used a modified Air Force Thor-Able intermediate range ballistic missile configuration as the first stage. Its second and third stages came from the Vanguard. The 1970s and 1980s saw further major improvements to the Delta vehicle. The 3990 series was the culmination of the improvements. The 3990 was the first rocket to make use of the powerful Castor IV solid motor.24 Each Castor IV produced 85,000 pounds of thrust compared to 52,200 pounds for the Castor II motors. 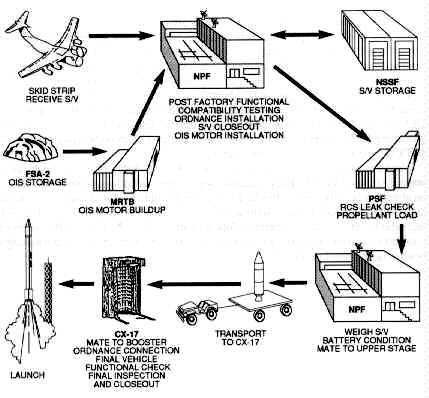 An optional third stage called the payload assist module (PAM) accompanied this series. The PAM originally supplemented the space shuttle by transferring satellites from low-Earth parking orbit to their final operational orbits. An unprecedented string of US launch vehicle failures occurred in 1985 through 1987, seriously impeding the US's ability to place payloads in space. The Delta II (6925 and 7925 series), which resulted from the USAF medium launch vehicle I (MLV I) competition, revitalized the nation's launch capability. This new generation of Delta vehicles primarily launch Global Positioning System (GPS) satellites and provides for the needs of domestic and international commercial communication satellite users. The second stage has a restartable Aerojet AJ 10-11 8K engine developed for the USAF. It uses nitrogen tetroxide and Aerozine-50 for propellants. The forward section of the second stage houses guidance and control equipment that provides guidance sequencing and stabilization signals for both the first and second stages. Nine Castor IVA solid rocket motors provide liftoff thrust augmentation for Delta II 6925 series. The Castor IVA uses new propellant and a new exit cone to increase thrust. The Atlas intercontinental ballistic missile development project began in 1945 as Air Force Project MX-774 with Convair (now part of General Dynamics) as contractor. The Air Force cancelled the program in 1 947 for lack of funds only to reinstate it in 1951. The basic one-and-a-half stage design has changed little in over 40 years and 500 ICBM and space launches. Significant advances in its capability and adaptability are reasons the Atlas has become the "DC-3" of space launch vehicles. As a sidelight, during development, designers determined that the Atlas needed corrosion protection from the salt-laden Cape Canaveral air. Convair chemists worked on many formulas to provide a wipe-on protection. This endeavor led to the development of WD-40, (water displacement formula, trail number 40) which now has worldwide applications. From 1957 to 1959, development efforts led to the first three versions of the Atlas. A total of 23 developmental flights led to the first operational flight of the Atlas D in 1959. 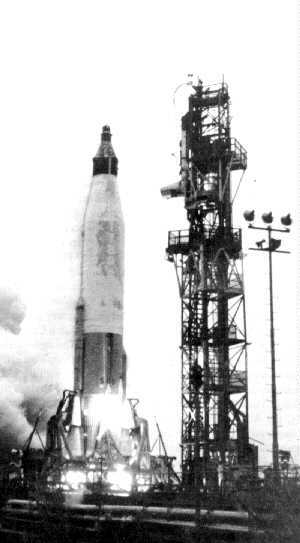 The Atlas D launched more times (123 launches) than any other version of the Atlas. The Atlas D used a cluster of three engines (two boosters and one sustainer) to comprise its one-and-a-half stages. This staging scheme has served on all subsequent Atlas vehicles. The second branch of the Atlas legacy was the LV-3. Versions of this rocket included the LV-3B, modified and man-rated to support the Mercury missions. In addition, the LV-3A (with an Agena upper stage) and the LV-3C (with a Centaur upper stage) were used extensively in the early years of the space program. Throughout the 1970s and 1980s, designers improved the Atlas to support the US space effort. This effort led to the Atlas G. This vehicle was a stretched booster designed for use with the Centaur upper stage. Improvements on the Atlas G included permitting all three engines to gimbal for thrust vector control and using the Centaur guidance system to control the entire vehicle in flight. Currently, the Atlas comes in two versions: the Atlas I and II. 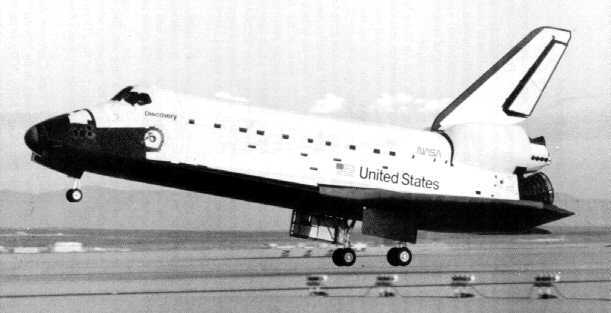 General Dynamics developed these versions after the decision was made to remove commercial payloads from the space shuttle. The Atlas I is identical to the Atlas G/Centaur with the addition of a metal payload fairing (PLF) available in 11- or 14-foot diameter configurations. Two additional planned versions of the Atlas II are the Atlas IIA and the Atlas IIAS. Atlas IIA and IIAS will have upgraded RL-10 Centaur engines with extendable nozzles. The Atlas IIAS will have four Castor IVA solid rocket motors to augment thrust at lift-off. The third generation of Titan rockets, developed in 1961, was from the outset a space launch system under the management of the Air Force. The program objective was to design a set of building blocks to cover a comprehensive spectrum of future missions without the inherent problems of a tailored launch vehicle. The common core is basically a Titan ICBM with structural modifications to support larger payloads. There were eight versions of the Titan III. Each version was a combination of the core vehicle either with a specific upper stage or no upper stage. Six versions had various sized strap-on solid rocket motors. Currently, there are two versions of the Titan in the DOD inventory. The first is the Titan II. Fourteen Titan IIs have been converted for space launch missions from the ICBMs deactivated by the Air Force in 1987. Potential modifications of the refurbished Titan II include adding either Castor IVA or GEM solid rocket motors, stretching the first stage, and adding two Titan first stages as strap-ons for additional thrust. The largest space launch vehicle in the US inventory is the Titan IV (originally designated the Titan 34D-7). This program started as a short-term project to complement the space shuttle in assuring DOD access to space. However, after the Challenger accident in 1986 and the subsequent space shuttle fleet stand-down, it quickly became the DOD's main access to orbit for many heavy payloads. The first Titan IV launch occurred on 14 June 1989. The Titan IV is made up of a two-stage core vehicle, two seven-segment solid rocket motors, and either an inertial upper stage--a Centaur--or no upper stage. The two seven-segment solid rocket motors attach alongside the 10-foot diameter core vehicle. The payload is encased within a 16.7-foot diameter PLF available in lengths of 56 to 86 feet. 3 A solid rocket motor upgrade (SRMU) program will allow the Titan IV to grow with the needs of its users. The SRMU program goals are to increase reliability, performance, and productibility. The Titan IV provides STS equivalent and greater payload lift capability enabling it to meet DOD unique requirements. The launch vehicle consists of an orbiter, two solid rocket boosters (SRB). and an expendable liquid propellant tank. The SRBs and three liquid propellant engines on the orbiter launch the system to an altitude of approximately 27 miles. The SRBs separate from the system and parachute to the ocean for recovery, refurbishment, and reuse. The orbiter continues the flight with the liquid propellant tank until main engine cutoff. Then the orbiter jettisons the external tank so that the tank reenters the atmosphere and falls into the ocean. The orbiter fires the engines of its orbital maneuvering system for a short period to gain power for insertion into Earth orbit. It can remain in orbit with a crew and payload for a period ranging from five to 20 days. It then returns to Earth and land like an airplane. NASA launches the space shuttle from the Kennedy Space Center on Merritt Island, Florida. From the Kennedy Space Center, NASA can launch payloads into orbits of 28 to 57 degrees inclination. Landing operations are conducted at Edwards Air Force Base, California, and Kennedy Space Center, Florida, with backup at White Sands Missile Range, New Mexico. The process of placing a payload into Earth orbit is not a simple or speedy task. Lt Col David E. Lupton in his book, On Space Warfare: A Space Power Doctrine, describes the launch process as similar to building an ocean liner from scratch, sailing it from Europe to the United States, and when within site of land using a rowboat to reach the shore while scuttling the ocean liner.35 The requirement to place a satellite in orbit takes a long road through the administrative (manifesting and documentation) and the physical (integration) phases. The following paragraphs describe this total process using the Delta II booster and Global Positioning System satellite as an example. The process starts at the Launch Services Office (LSO) at Air Force Space Command. The LSO collects and documents space launch user requirements, coordinates expendable and manned launch system manifests, identifies launch conflicts and recommends options for resolution, and provides space launch support plans for all Air Force operated extraterrestrial launch vehicles and for DOD use of the space shuttle. Source: 6555th Aerospace Test Group Briefing,Cape Canaveral AFS, May 1991. The delivery of the satellite via air transport to Cape Canaveral Air Force Station initiates the flow. The satellite either awaits processing in the Navstar Satellite Storage Facility or goes directly to the Navstar Processing Facility (NPF). In the NPF, the satellite undergoes post-factory functional testing, compatibility testing, ordnance installation, and installation of the apogee kick motor or orbit insertion system that will place the satellite in its final operational orbit. From the NPF, the GPS satellite proceeds to the payload servicing facility for the hazardous operations of reaction control system (RCS) leak checks and loading the hydrazine (the RCS propellant). 1. AFM 1-1, Basic Aerospace Doctrine of the United States Air Force, vol. 1, March 1992, 7. 2. AFM 2-25, Space Operations, 29 March 1991, 18. 3. MSgt Warren Wright, "Quayle Announces New Launch Strategy," Space Trace, September 1991, 4. 4. TSgt Dennis Sanchez, "Eastern and Western Ranges" (Unpublished paper, AFSPACECOM/DOS, May 1992), 2. 10. Defense Science Board, 1989 Summer Study on National Space Launch Strategy (Washington, D.C.: Office of the Under Secretary of Defense for Acquisition, March 1990), 13. 11. "Air Force Space Command Paper" (AFSPACECOM/DOSL, 16 September 1991), 13. 34. Air Command and Staff College, Space Handbook (Maxwell AFB, Ala.: Air University Press, 1985), 13-1 through 13-14. 35. Lt Col David E. Lupton, On Space Warfare: A Space Power Doctrine (Maxwell Air Force Base, Ala.: Air University Press, June 1988), 23. 40. Maj Andrew Kraska, Director of Operations, 1st Space Launch Squadron, Cape Canaveral Air Force Station, telephone interview with the editor, May 1992. 45. TSgt Dennis Sanchez, "Delta" (Unpublished paper, AFSPACECOM/DOS, May 1992), 4.